When the rain starts falling, there’s ice on the ground and the temps drop low enough to make gear a challenge, it’s time to ramp up our tricks for staying motivated to get out there and go for a ride. Here are our top 5 tips to get you motivated to ride! Once you set that date, unless you’re a flake you’re locked in. There’s a golden amount of accountability here so go with it. Stick to your plan and meet up with your riding buddy. You’ll be so glad you did! Cut yourself some slack, it’s cold out! Winter is traditionally a time to get cozy and hibernate, so don’t beat yourself up for cutting back on the miles. Keep your attitude positive, not self loathing, and you’ll be a stronger person for it. And when you’re a stronger person, emotionally, you’ll be able to conquer additional miles, even if they don’t come until next summer. It’s true: Be nice to yourself now, and you’ll have a stronger summer. Get yourself excited to ride a new region. Cross train with yoga, stretching, swimming, spinning or another complimentary activity. You may not get all of your activity on the bike, but you’ll be maintaining strength and in some cases making yourself even stronger as a result. The main idea here is to keep yourself inspired. The same-ole same-ole ride just doesn’t cut it in the winter. 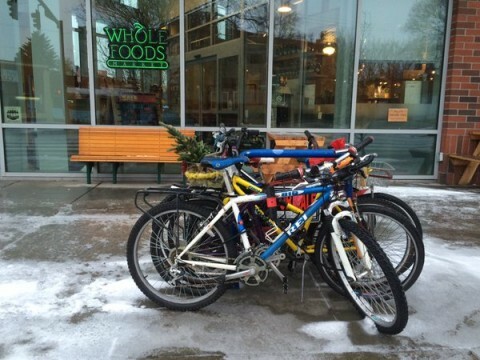 If you’re a bike commuter, keep it up all winter long. That’s the easiest way to get in some regular riding. Even if your rides aren’t long, they’ll be beneficial. You did it! You braved the cold, suited up and went for that blustery day ride. You deserve a treat. Whatever it is that makes you happy, go for it. A warm drink afterwards (hot toddy, anyone? ), a beer, a slice of pie, dinner out with a friend – whatever it is, enjoy it as you pat yourself on the back. Strict dieting has been shown to make people grumpier and lead to overly indulgent binging. Instead, eat a generally healthy diet and allow yourself those occasional treats – especially the ones that are rewards for a job well done.